Microwave the butter and chopped chocolate. Heat for 1 minute on high, stir well until all the chocolate and butter melt. Heat for 30 seconds more if necessary. Add the flour, cocoa powder, cinnamon, chili, baking powder and pinch of salt. Mix vigorously until you have a thick batter. Place paper lining in each cupcake tin and fill with equal amounts of batter. Bake for 23-26 minutes until a toothpick comes out clean when inserted. Decorate with chocolate frosting. Sprinkle lightly with chili pepper powder. Try to make the cupcakes on the same day you’re going to serve them, at most the day before. I love celebrating Three Kings day. Usually we start the day with a breakfast of cupcakes or donuts, but if there’s school that day we save the sweets for the afternoon. 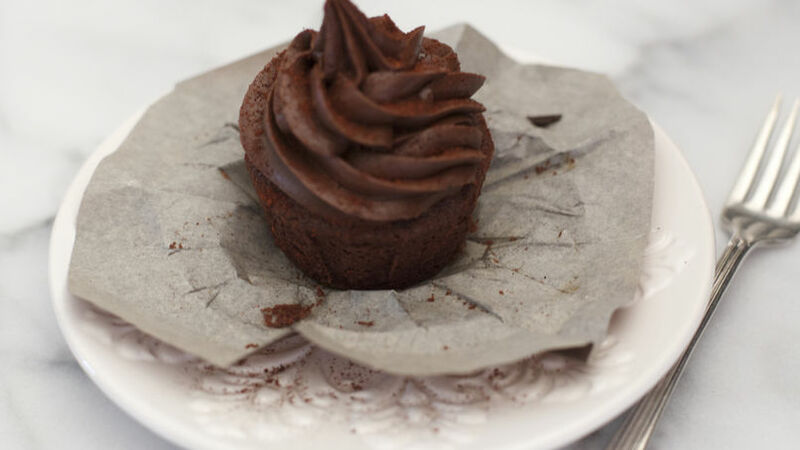 These cupcakes made with traditional Mexican chocolate are a favorite in my house. The chocolate and cinnamon flavor is unforgettable. You can replace the ancho chili pepper with chipotle to create a spicier cupcake. Whatever you choose, your loved ones will definitely enjoy these cupcakes!